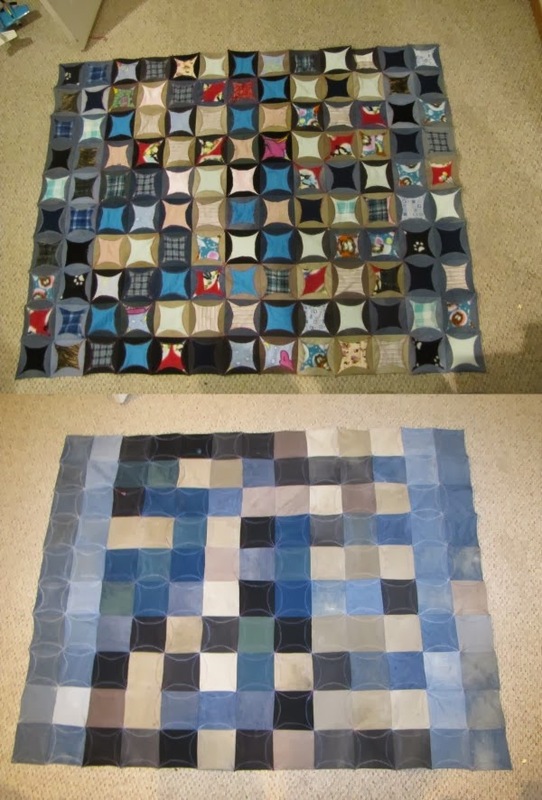 Started in 2009, finished in 2010. Reason: This was a gift for my sister and brother-in-law as a Christmas / Housewarming present. My sister is a lily grower so it seemed appropriate. Pattern: It is all paper pieced. 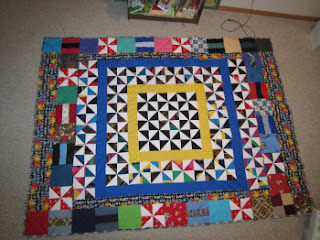 Every time I do a big paper pieced project I say never again. Clearly it doesn't stick because I have another one in the works. 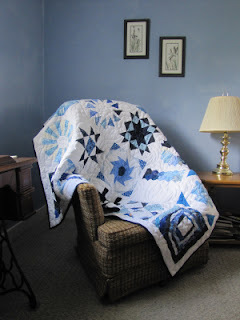 If I can find the author of this pattern, I'll post it. 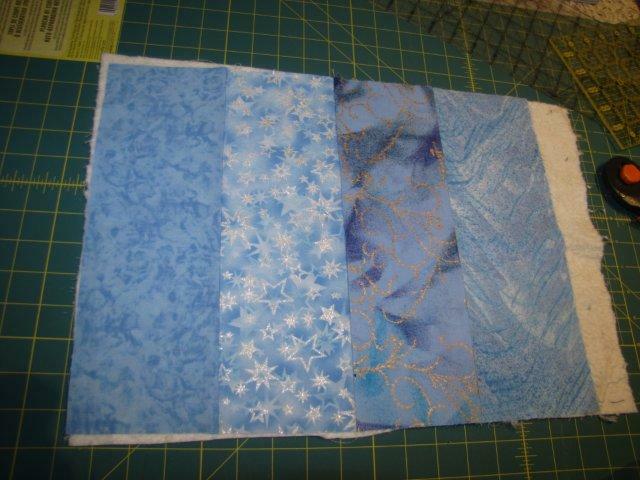 Fabrics: Most of the fabrics were from my stash. It was really fun and a little scary picking all the colours by shade values. Reason: Part of my goal to make 12 quilts for missions this year. Thoughts: I made my goal two months early! Whoo hoo! I'm so excited! I also received flannel and fabric from MCC. 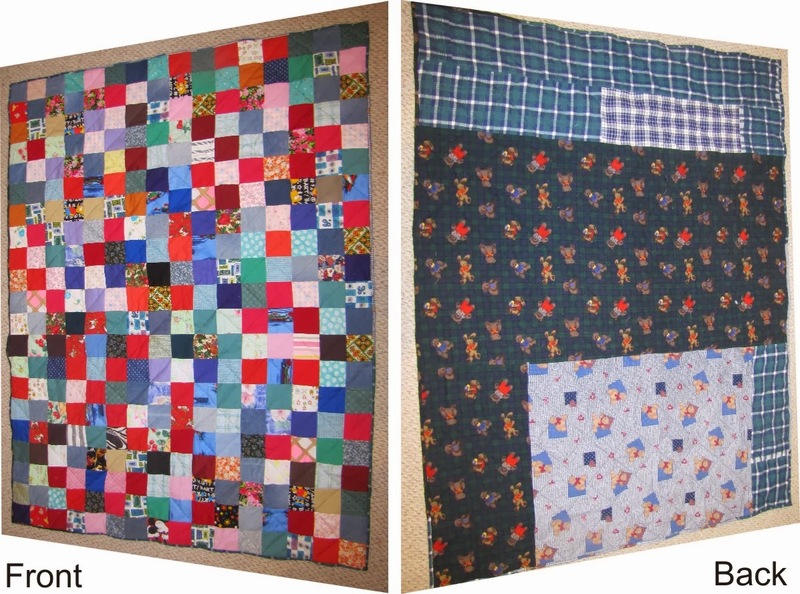 The quilts I made with them went back to MCC. 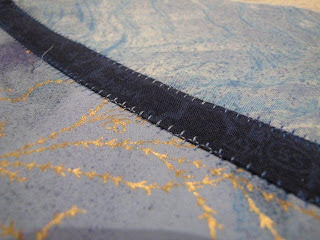 Thoughts: I loved this technique and the unexpected patterns on the back the thread made. Most of the denim was from my friend Ben. The flannel was from Jane and Melody. 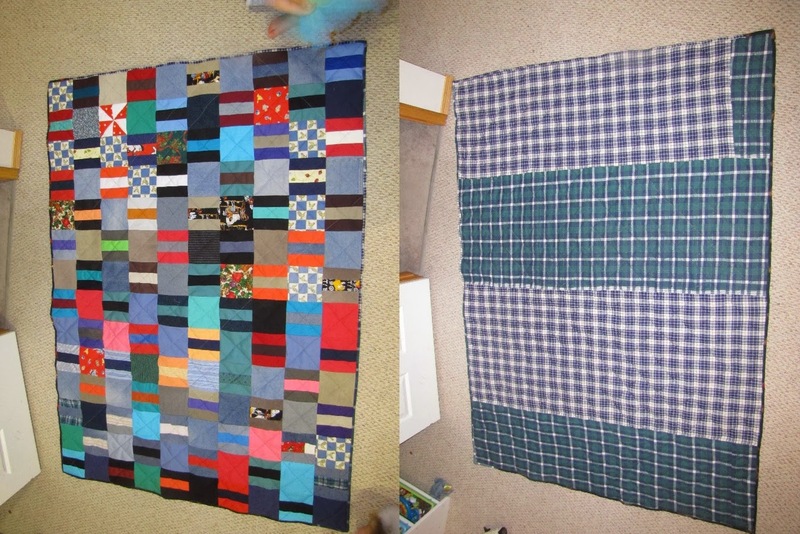 This quilt will likely go to Streets Alive. Reason: Part of my mission to make 12 mission quilts in 2013. Thoughts: The top was made from apple box fabrics. The back is fabric that Mum bought me in Mexico. If they go back to Mexico next year, I'd like them to bring it down there to give away. 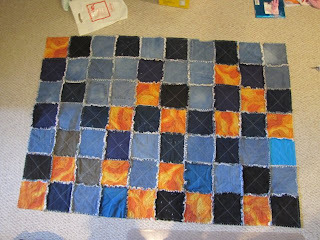 I used this quilt to practice free motion patterns and methods. 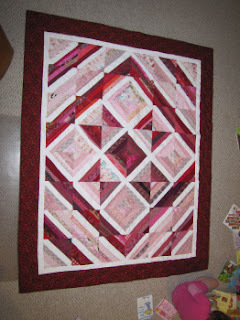 Inspiration: www.craftsy.com - I found their 2012 Block of the Month and loved it from the first month. I did the whole top in two weeks. 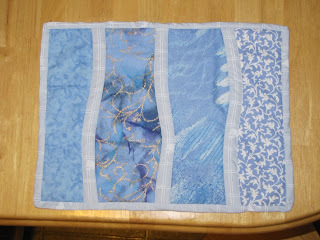 Fabrics: This was all done with scrap. My drawers do not look any less empty. 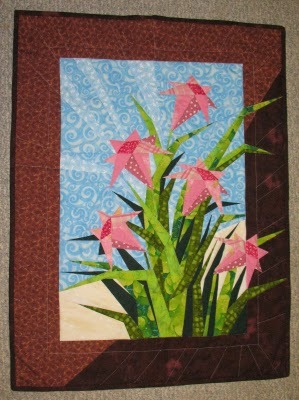 Nancy Pauls in Manitoba quilted it for me. I should have done it on point - it would have looked so much more interesting. I am considering doing another just to see what it would look like. 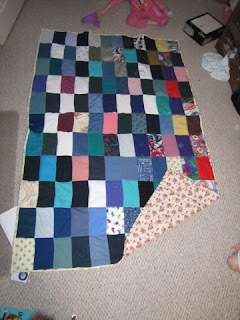 Reason: I have so many scraps and strips both from my own quilting and from what my aunt and grandma have given to me. After doing Craftsy.com's BOM 2012, I realized that a string quilt was the perfect way to use up my mountain of fabric pieces. 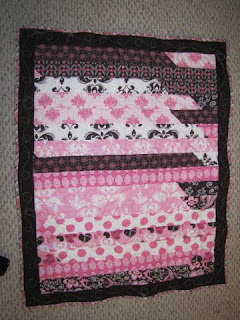 Thoughts: All I know about free Motion quilting is from Leah Day - see link on side bar. 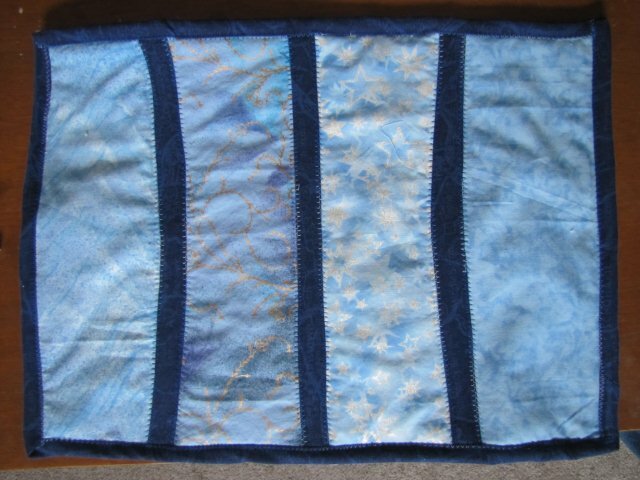 This quilt will be auctioned of at the MCC relief sale in Coaldale next month and is eighth in my series of 12 quilts for mission organizations this year. Four to go!! 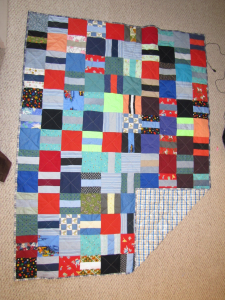 I started this top years ago and stuffed it in a closet because I wasn't careful with the measuring so I knew I had an uphill battle to finish it well. Dora gave me a hand made shirt from MCC. It was black and striped with bold colours. 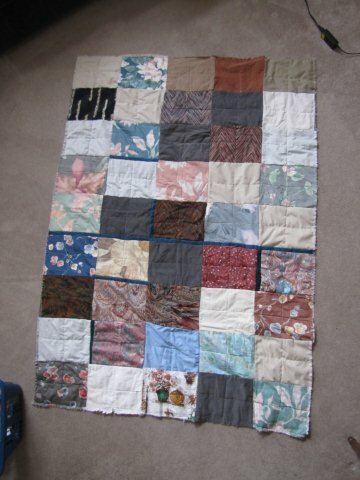 She challenged me to make it into a quilt. That's what the pinwheels are made from. With fabric my mother bought for me in Mexico for the back, I completed this top and donated it back to MCC to be used in relief work overseas or sold in the local thrift store. 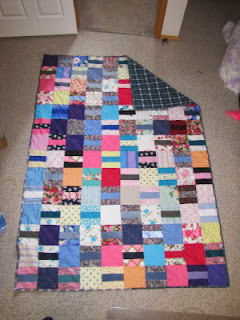 Reason: I bought a jelly roll at Walmart that easily made two baby quilts. This one is slightly larger that her sister because I added the pink plaid border. Thoughts: A friend bought this for her daughter. I made this top a year or so ago and stuffed it in a closet. With fabric donated from a drapery store for the back, I completed this top and donated it to MCC to be used in relief work overseas or sold in the local thrift store. 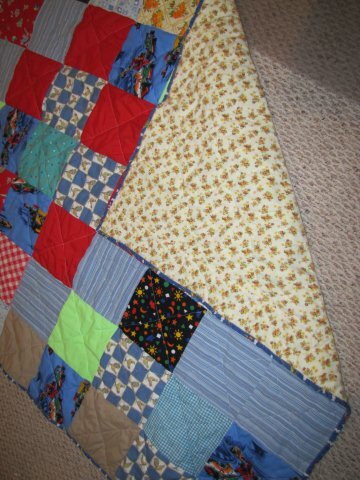 This quilt will go down to Mexico at Easter. Lessons: This is from my apple box fabric. I made it more than a year ago, discovered that I had cut corners (assumed that someone else's cut squares were identical in size) and thus had split seams and threw it in a corner. 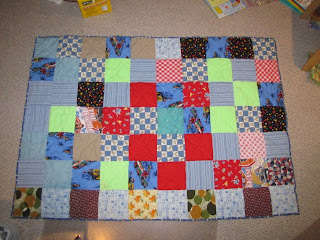 I used 2" wide strips of fabric, folded them in half like I was binding and sewed them down next to the split seam - raw edge to raw edge. I then folded the strip over, again as if i was binding and hand stitched the folded edge on the other side of the seam. Problem solved. This quilt went down to Mexico last week. It is 4/12 quilts for missions this year. The top was made and forgotten last year. 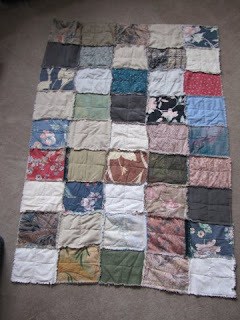 I'm pretty sure it was one of the first Apple Box quilts. 3/12 is uglier on the flannel side because I wanted to use every scrap of flannel I could, but I love how the orange and blue looks together. I should do this on purpose . . . In my quest to do 12 quilts for missions organizations this year, here is #2. This one is in Mexico. 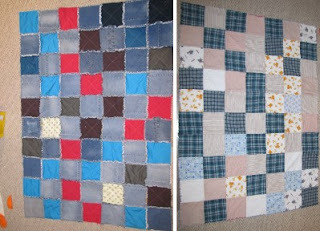 I used denim from my huge tubs full, heavy fabric from the Apple Boxes and flannel from many sources. Then I had some fun. 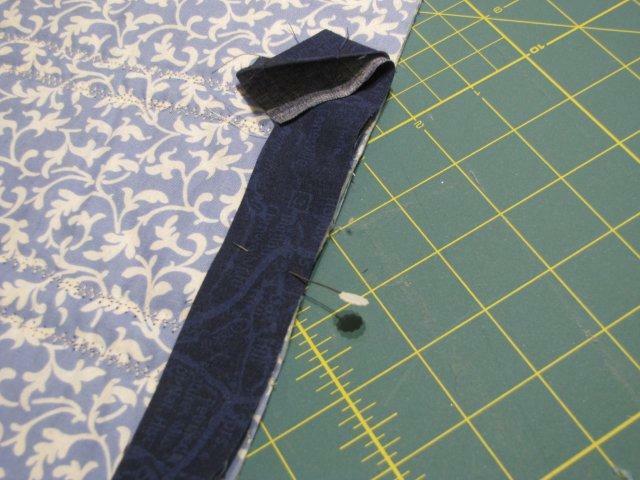 Start with strips of fabric that are about 4½" x 11½". They're placemats. The size isn't critical. 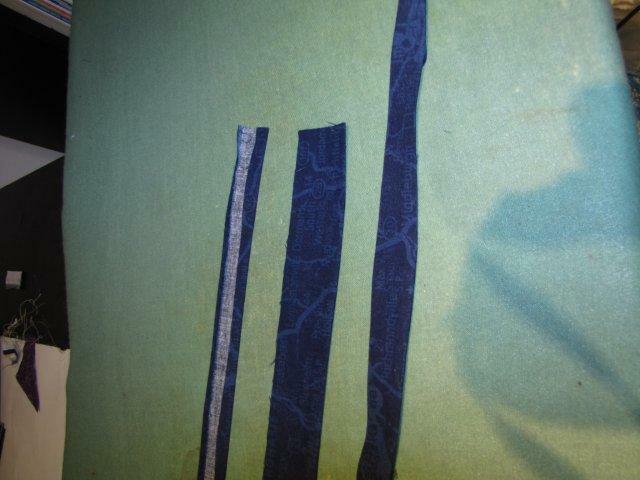 Sew the strips together with a quarter inch seam. 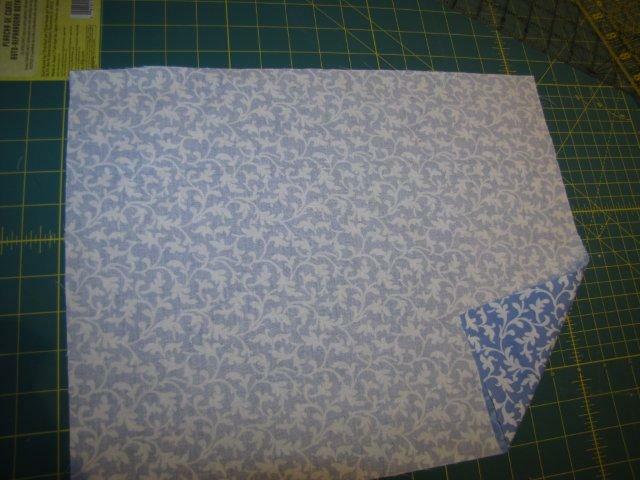 Cut backing fabric to be slightly larger than the front. That'll make it maybe 18 x 12 or so. 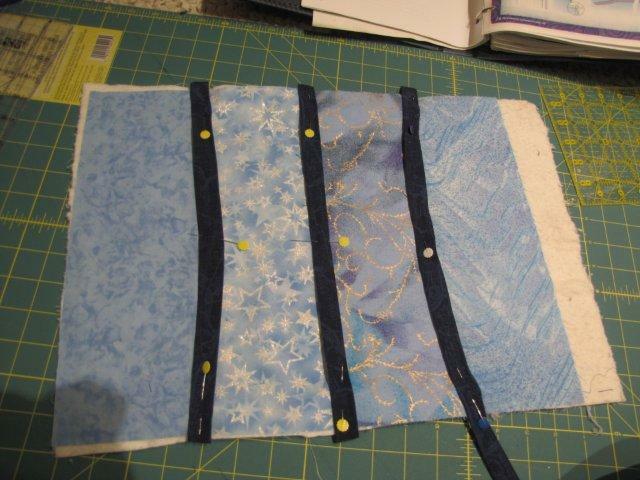 Cut binding and bias strips. The bias strips should be approximately 1¼" wide. 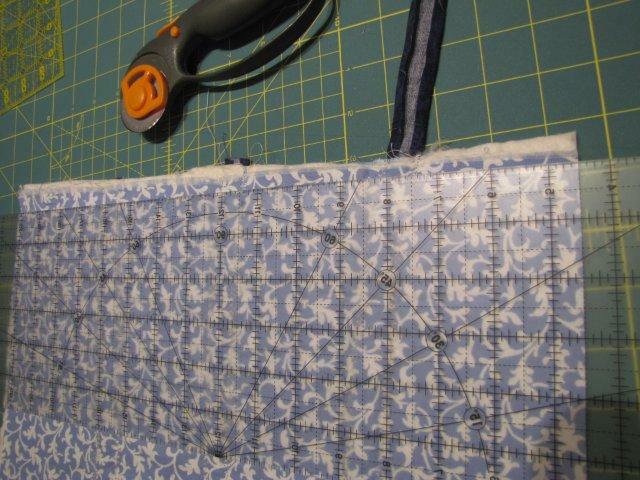 You'll need a strip about 40" wide (the length of your fabric) for one placemat. 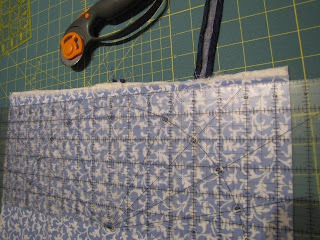 I cut my binding at 2½" Each placemat used about a 60" long strip. 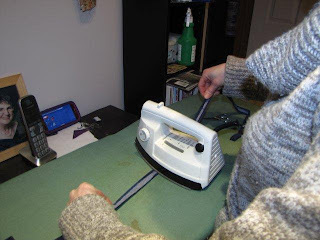 Piece your binding strips together and iron them in half. 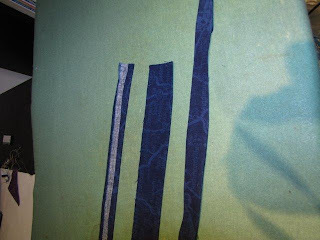 Create bias tape by ironing your edges under. Fast bias - just pull it under your iron. Lay your backing fabric pretty side down and smooth out. Layer fill and your topside down, smoothing everything out. Pin your bias down. 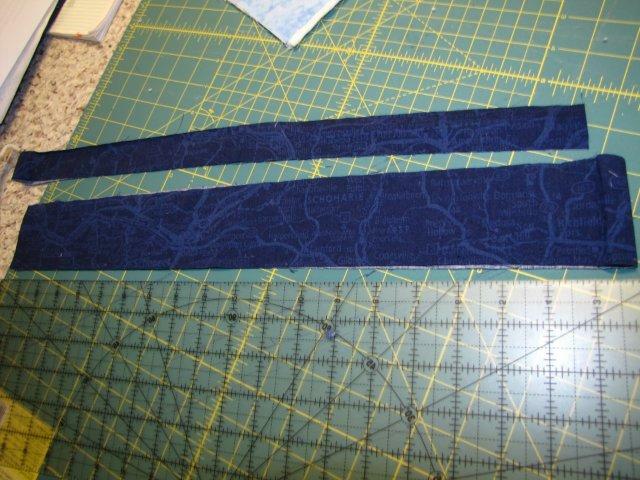 Do straight lines, curvy, whatever, but try to keep the bias over your seam lines. Choose a stitch and sew down your bias. 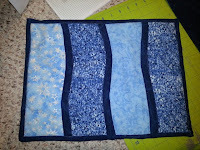 The beauty of this project is - you just quilted it too! 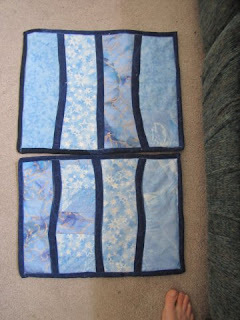 If you plan to hand bind the mats, go ahead and attach your binding on the front as usual. Because I'm going to machine stitch mine down, I'm going to attach it from the back so the pretty stitching is perfect on the front. Voila. 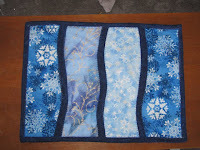 I did my placemats individually when I had minutes and found they took about 35 minutes each. If you had the time to do each step once for the entire quantity of mats you need, I bet the time per each would be cut down substantially. Reason: I got wind of a care package being sent to a friend in Africa. She works with street boys. I thought a quilt might be useful. 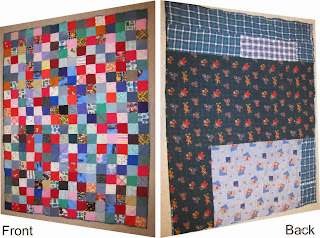 Fabrics: All these fabrics were given to me for the purpose of making utility type quilts for charitable organizations. 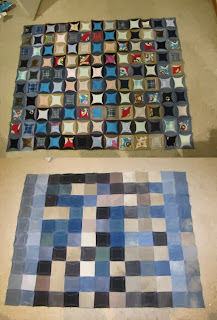 Thoughts: I see God in the making of these quilts when the right pieces are available in the right sizes. 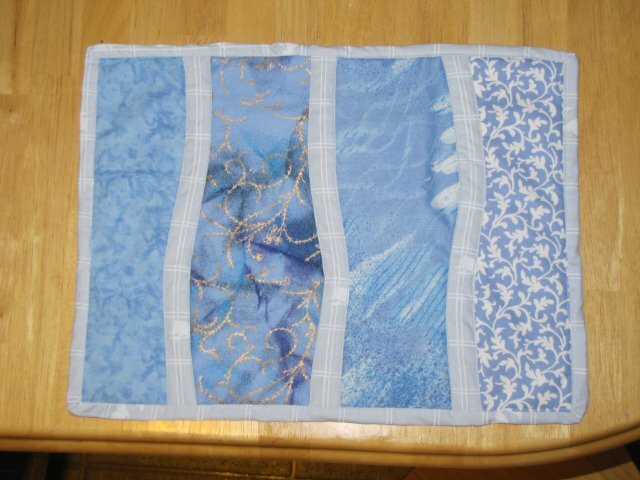 Reason: When I found the fabric for purple, I also fell in love with this roll set. One roll is going to make me two baby quilts. Here's the first. 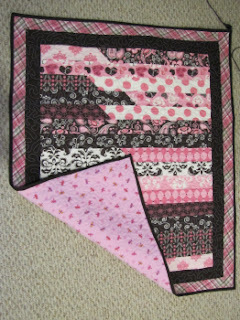 Thoughts: This quilt top and her sister top have been hanging out in a box waiting for me to find the right chocolate for the border. I'm glad to be able to get one of the two off my extensive to-do list. I've got a little ripple going on here but I don't think I was tugging too much on the binding too much. 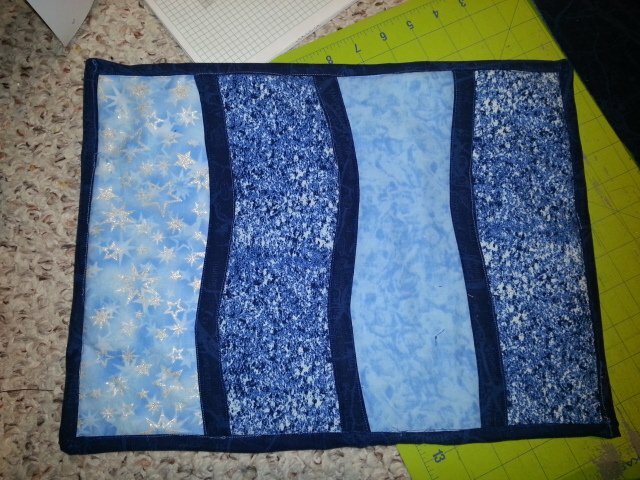 However, I did quilt the border separately so I'm wondering if that made the difference. 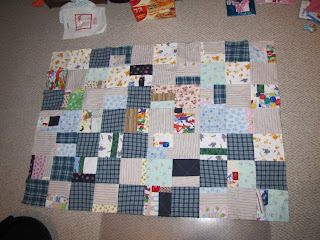 I'll quilt to the edge on the next one and see if that changes anything. Update: January 2014 This quilt was given to a baby named Emily.